Avoiding the obvious platitudes, Chum Noy, the cultural events man-ager, said that the exhibition is a step forward for the contemporary art scene in Phnom Penh. Water has been central to the Khmer psyche for millennia, said Tith Veasna, the exhibition’s curators, pointing to the extensive hydrological infrastructure of the ancient Angkor empire and the pervasive wetlands that cover much of the country in wet season as examples of why. The artists were asked, “How does water affect human life?” Tith Veasna added, resulting in sometimes complex considerations of the consequences of development, such as pollution and flooding. “To destroy the environment is not only to destroy ourselves, but also destroy the future,” she said. Heim Ankanitha, 25, examines the disparity between traditional folk Cambodian traditions surrounding water and the actions of modern Cambodians. “People say water is life but they never think about water,” she said. Weddings were once held by the waters of Boeung Kak Lake in Phnom Penh, Heim Kannitha added, until steady encroachment and a growing population sent pollution levels soaring. Her work, an intriguing trio of collages, questions the wisdom ignoring traditional attitudes, with a teeming wetland showing what’s at stake, and a giant question mark to underline the quandary. When tensions broke out between Cambodia and Thailand over ancient temples along the border, food and drink shop keeper Ros Vo never expected it would be a boon for Cambodian-made products. “I’m really surprised how many of my customers ask for Mee Yeung instant noodles,” Ros Vo told Eco-nomics Today. 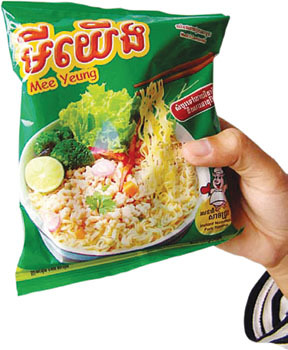 Mee Yeung noodles are produced by Men Sarun Company at the first wholly Cambodian-owned noodle factory to operate in the country. The company began producing packaged noodles late in June in Kandal province. នៅ​ថ្ងៃ ២២ ខែ កុម្ភៈ ឆ្នាំ ២០០៨ ក្នុង​ចំណោម​ប្រិភូ ៣០​រូប មាន​ប្រតិភូ​កម្ពុជា​ចំនួន ៧​រូប ដែល​បាន​ចូលរួម​វេទិកា​កម្រិត​ខ្ពស់​ស្ដី​ពី​សេដ្ឋកិច្ច​ចំណេះដឹង ដែល​ត្រូវ​បាន​រៀបចំ​ឡើង​ដោយ​វិទ្យាស្ថាន​ធនាគារ​ពិភពលោក (WBI) និង​វិទ្យាស្ថាន​ដើម្បី ការអភិវឌ្ឍ​នៃ​ប្រទេស​កូរ៉េ (Korea Development Institute School) ។ អ្វី​ដែល​នៅ តែ​ជា​សំណួរ​នោះ​គឺ​ថា ៖ តើ​ប្រទេស​កម្ពុជា​អាច​ក្លាយ​ជា​កូរ៉េ​ខាង​ត្បូង​ទី​ពីរ ឬ​ឥណ្ឌា​ទី​ពីរ​ក្នុង​ការ​សម្រេច​បាន​កំណើន​សេដ្ឋកិច្ច​ប្រកប​ដោយ​ចិរភាព​ក្នុង​រយៈពេល​វែង​ដែរ​ទេ? The time for Cambodia to exploit its oil and gas resources is drawing nearer as national energy officials have announced that production of oil and gas will start in 2011. “We will produce the first oil products for Cambodia in 2011 to reduce the import of oil,” Te Duong Tara, Director General of Cambodian National Petroleum Authority (CNPA) told VOA Khmer during a conference on oil and gas in late March. This could be good news for the country because it will mean large revenues will be added to national accounts, which, government officials say, will be used to finance public investment programs. Are we headed for a worldwide economic downturn? The world economy and market systems have been shaken in the last few months and several organizations have adjusted their growth projection for countries and for the world. In an age of increasingly integrated economies, the 2007 US “subprime” crisis has been the snowball that has transformed into an avalanche, which threatens to submerge the world through financial crisis, plunging stock markets, runaway inflation and global recession. Cambodia, like other countries, is not spared and its economic growth for 2008 has been revised downward to take into account this economic deflagration. The country’s growth rate was 10.1 percent in 2007, according to the Ministry of Planning’s National Institute of Statistics. Early this year, analysts expected the economy to fare less well but still to remain strong with an 8-percent growth rate.